This iBall phone Packs 1.2GHz Quad core processor inside to meet demanding apps and games. The chipset contains 1GB of RAM for easy multitasking. This phone has screen size of 4.5 inch and resolution of 960*540 pixels. With pixel density of 245 ppi, the screen looks good. The total internal flash storage is of 4 GB. The user-available will be less. For shooting purposes, we've a rear camera of 12 megapixel. You can self-shoot with 3mp camera located at the front. 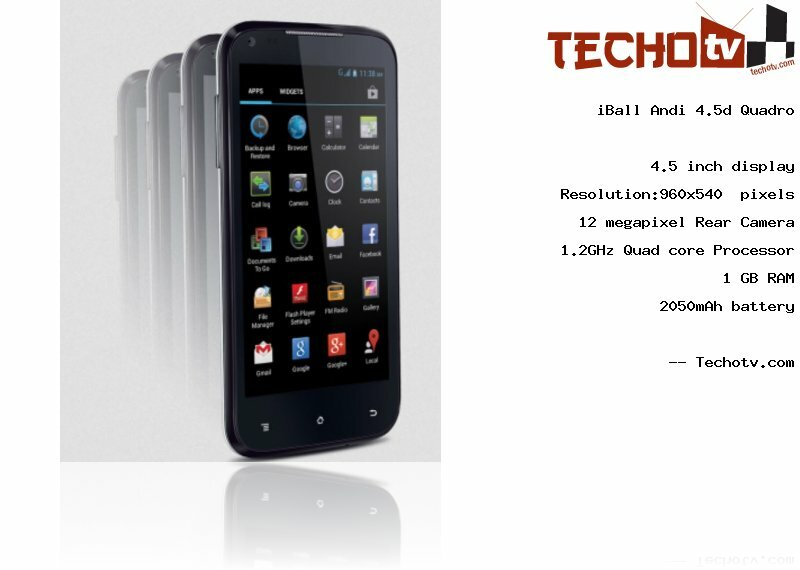 Sorry, The price of iBall Andi 4.5d Quadro is not available at the moment. Our team is keeping an eye on online stores to get you the latest price as soon as available. Sensors - Proximity, Gsensor, Magnetic, Light. Bundled accessories like flip cover and screen guard in the box contents for free. User available internal memory - 2GB out of total 4GB.